Many of us often don't understand the difference between Zionism and Judaism. Here is an interesting interview of Orthodox Jewish Rabbi Yisroel Weiss. Watch and listen carefully what he has to say about Zionism and how this secular materialistic ideology has hijacked the spiritual Judaism. Also know that how Zionism is against the true teachings of Torah and direct violation of God's will as stated in Talmud. Here is the interview at Fox News from youtube (approx. 4 minutes). Another audio interview where the Rabbi is giving answer to the question: People are sometimes confused between Zionism, Judaism and Jewishness. Can you please clarify? The real player audio lecture is here. For detail of the explanation the following videos may be helpful to have a better picture. 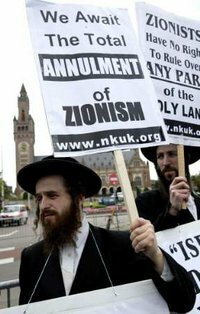 Rabbi Yisroel Dovid Weiss is the spokesperson for the Neturei Karta International - Jews against Zionism. He is descended from Hungarian Jewry, his grandparents were exterminated by the Nazis at Auschwitz.